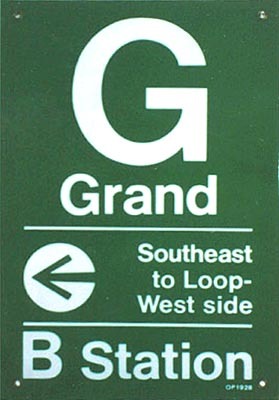 Grand is typical of the Milwaukee-Dearborn Subway stations outside of downtown. The architecture of the station was streamlined Art Moderne with some Art Deco elements, simple and austere compared to earlier subways in New York, London, Paris or other systems but very much in the style and fashion of the period in which it was designed. At street-level, the entrances were very simple, consisting of stairs down from the sidewalk surrounded by simple tubular railings with a smooth identification pylon at the back with Deco rings around the top. 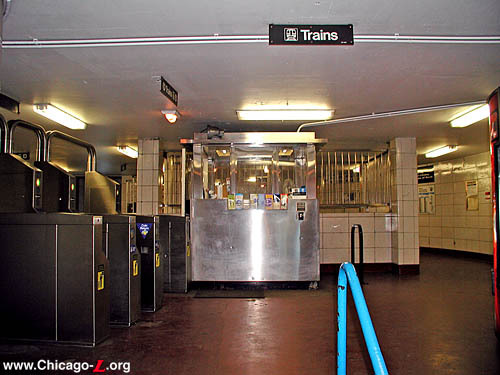 The fare controls were at a lower mezzanine level beneath the intersection of Grand and Milwaukee avenues and Halsted Street. 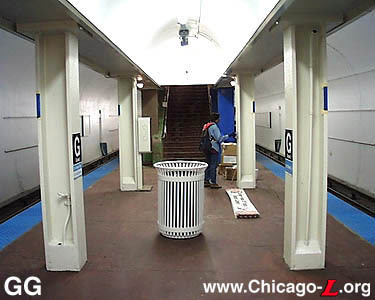 Because the mezzanine was below one of Chicago's many "six-corners" intersections and there would potentially be a multitude of streets to cross to get to an entrance, a number of passageways were excavated from the mezzanine to different corners of the intersection, providing five street entrances in all. This assured that an individual had to cross no more then one street, if any, to get to a stairway. The station mezzanine had broadly curving walls clad in off-white glazed ceramic tile, which served to both reinforce the Moderne, streamlined architectural style employed in the Initial System of Subways stations as well as to direct passenger flow through subtle design cues. The interior had smooth concrete floors and ceilings, red for the former and a neutral color for the latter. 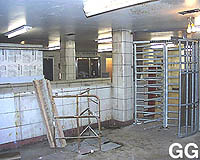 The fare control booths had a square shape -- simplified versions of the angled, lozenge-shaped Deco-designed booths of the downtown stations -- and were made of stone walls with a small ventilation grate near the bottom and glass windows on all four sides, allowing for maximum visibility of the mezzanine for the station agents. Turnstiles were steel. The mezzanine also had several amenities for the use of passengers, such as public phones, lockers, and restrooms. The island platform had red no-slip concrete floors, curved, barrel-vaulted concrete ceilings and a row of I-beam steel columns along each platform edge. Unlike some of the more ornate subways in other cities, the walls along side the tracks in the stations were left as unfinished concrete rather than tiled. To aid in station identification, each station had a color scheme that was used in the accents like tile borders, platform column color, and signage lettering and background. The colors blue, red, green, and brown were rotated in sequence beginning up at Division & Milwaukee. Grand's accent color was green. A specially-designed Futura typeface was used throughout the subway on metal, tile, and backlit glass signs. Fluorescent lights and illuminated station signs hanging from the ceilings finished the decoration. Though much of the structural work of the Milwaukee-Dearborn Subway was concurrent with that of State Street's (which was begun in 1938 and opened in 1943), construction on the Dearborn line was suspended in 1941 due to wartime materials shortages. Even after the war was over, it was another several years before work was resumed. Finally, the Milwaukee-Dearborn Subway was completed and opened on February 25, 1951, eight years after the State Street tube was inaugurated. This is when Grand station opened. "Peer down from the sidewalk down the stairwells and you'll see heaps of rubble containing an array of empty beer and soft drink cans, discarded newspapers, paper bags, an assortment of paper and foam cups, round pieces of cardboard that once held pizzas, a drained Gordon's vodka bottle, an old boot, a glove, and even a couple of wet socks. 'There's a bad odor down there, and couple of people have seen rats,' said Chris Bekas, the owner of Chris' Grill, one of three restaurants on the intersection. 'I called the CTA three times, and I haven't gotten any satisfaction." Presumably, the problem was taken care of. The platform was repainted around 1994 due to excessive graffiti, but there didn't seen to be problems with graffiti afterward. 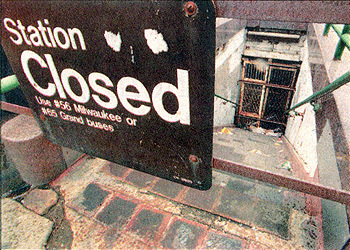 CTA planners had been investigating reopening some closed stations for quite some time when the CTA Board approved the reopening of Grand/Milwaukee on Tuesday April 20, 1999. The area bounded by the Union Pacific Railroad, the Kennedy Expressway, the North Branch of the Chicago River and Chicago Avenue has seen a great deal of growth recently, especially of young professionals. 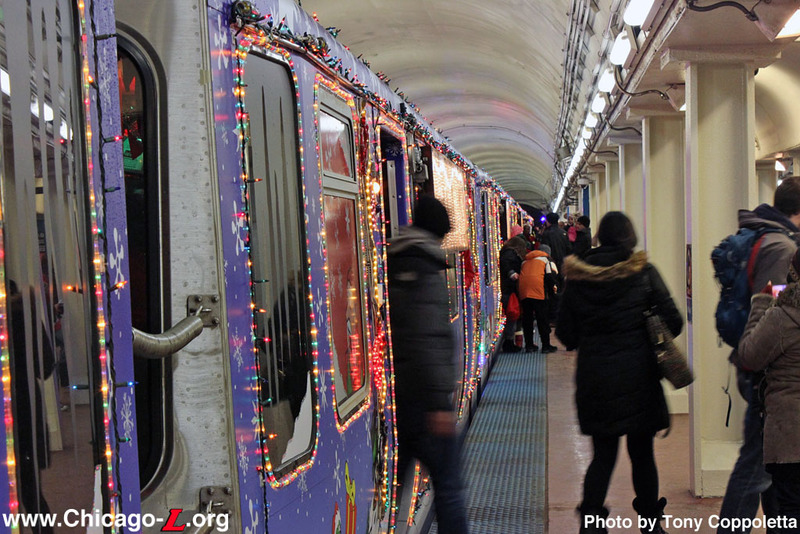 The CTA saw these a great source of new ridership and wanted to actively pursue them as potential riders. Many of these potential customers were not taking transit at the time, so CTA felt that reopening the station wouldn't draw passengers from Chicago/Milwaukee or other nearby services. At a cost of approximately $1.3 million, the station received a nice, modest overhaul. Down in the mezzanine, one of the old agents' booths was removed and the other was replaced with a stainless steel and Plexiglas model of a design similar to the original. On that side are the TransitCard turnstiles while on the other are exit-only rotogates. New lighting and public phones were installed, along with new signage, schedules, and lighting. The walls and floors received a power washing and one of the old washrooms (long since closed off to the public) became CTA offices. 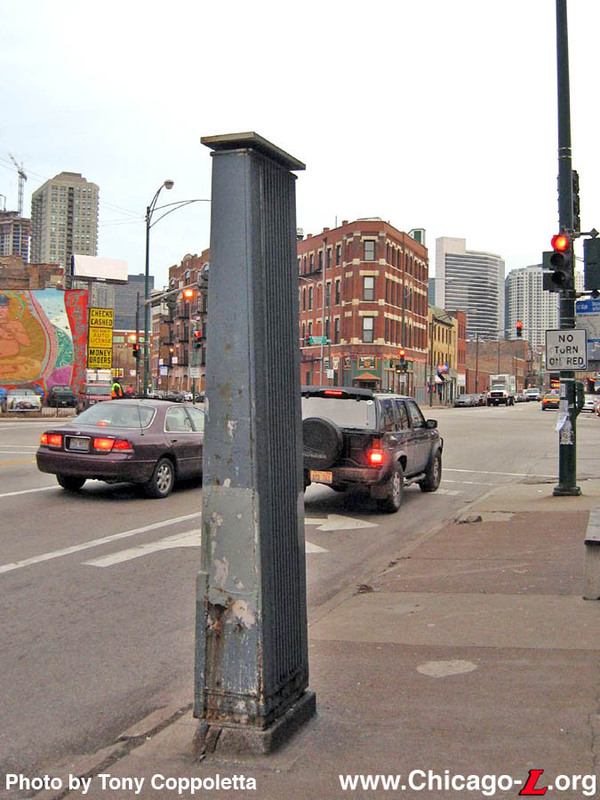 Also as part of the rehab, three of the five original street-level entrances were blocked off and filled in, leaving only two (on the northwest corner of Grand & Milwaukee and on the northwest corner of Milwaukee & Halsted) in operation. The two long hallways leading these three stairwells were blocked off in the mezzanine with cinderblocks covered with gray tile that somewhat match the original 1951 ceramic wall surfaces. A door on each sealed wall allows CTA access to the old halls, which are used for storage, and soda vending machines sit against the walls outside. 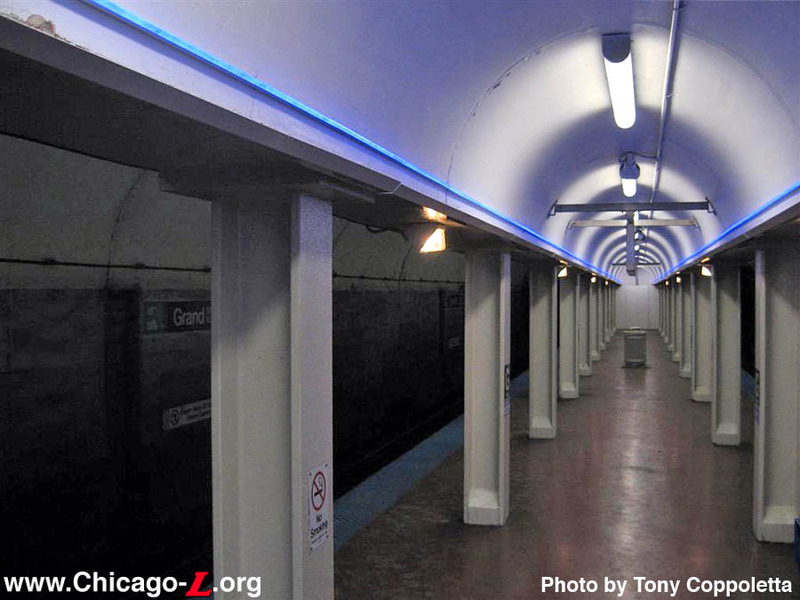 On the platform, the outer tube walls were given several coats of white paint and sealant and they were so bright when the station reopened that they reflected the light from the fixtures! The steel I-beams were likewise painted white, with a blue stripe denoting the Blue Line. New Green Line Graphic Standard-style symbol signs were installed on the columns and name signs were installed on the outer walls, with a Navy Pier pictogram in the blue tabs to the right and left of each sign (geographically, Grand/State is closer to Navy Pier than Grand/Milwaukee). The original hanging backlit Moderne station signs were unfortunately removed, but several power-washings of the floor with a highly-pressurized water spray revealed the red cement floors that were once nearly unrecognizable with grime. 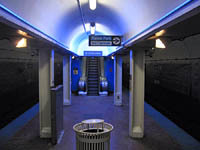 Architectural details in the original tile, like borders, pilasters, railings and the station name depressed into the wall in green highlights, were repainted blue to, again, evoke the Blue Line. The station reopened on June 25, 1999 at 0600 hours. 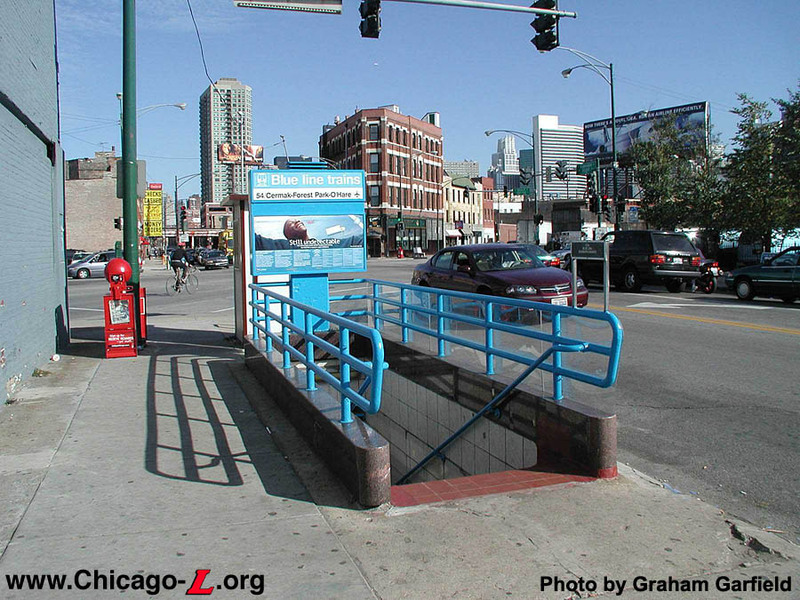 Grand was included in the CTA's "Front Door Program", an initiative to add amenities and make aesthetic improvements to station entrances throughout the rail system. At its June 4 , 2003 monthly meeting, the Chicago Transit Board approved a $569,973 contract for Chicago-based Camp Dresser & McKee, Inc. (CDM) to design and prepare construction bid documents for the Front Door Program, which includes seven stations (Grand included). Upgrades at the seven stations were to include station identification signage, new fencing, reconfigured turnstiles, improved lighting and heating systems, benches/street furniture, improved bus waiting areas and bus information panels, landscaping and windbreaks, though not all seven locations were to receive all of these improvements. Funding for this contract was provided by the FTA and the Regional Transportation Authority (RTA). The improvements were designed but never performed, with the project funds diverted to other needs. Beginning in late January 2007, various types of experimental lighting were installed on the Grand platform. 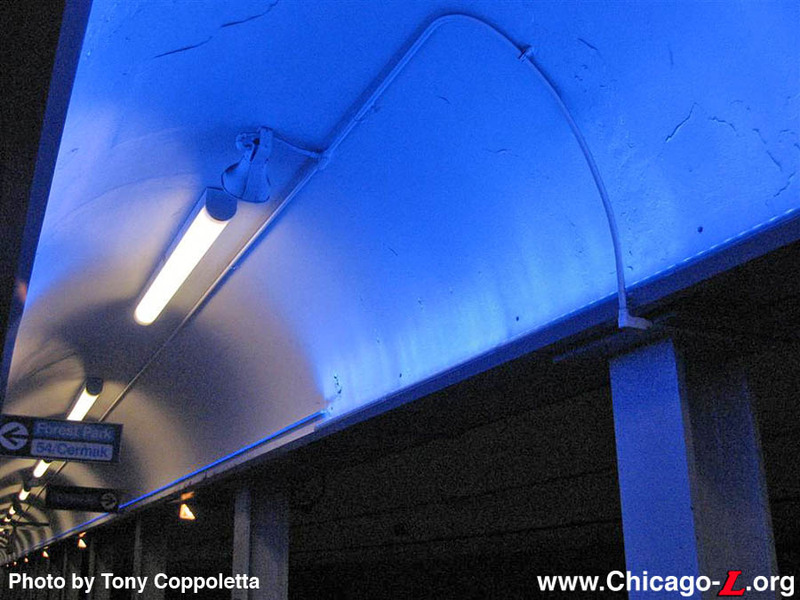 First, different types of blue lighting was installed along the bottom edge of the center vault over the platform. Some sections have blue-colored LED light tubes (similar in appearance to neon, but a different technology), while others have lights that cast tinted illumination put onto the center vault. Later, in February, new lights were installed under the soffit of the colonnades along the platform edges, alternating between various fixture types. 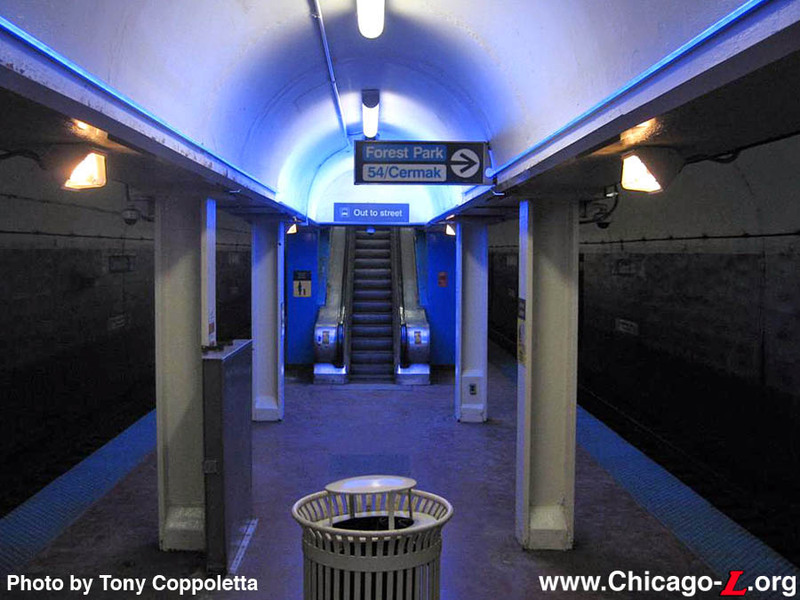 This is evidently a Chicago Department of Transportation (CDOT) project, not CTA's , to test various lighting technologies for future subway station renovation projects. CDOT, as owner of the downtown subways, is responsible for large-scale capital improvement projects in these subways. The $492 million plan, called Your New Blue, includes several track and station improvement projects along a 12.5-mile stretch of the Blue Line between the Grand and Cumberland stations, as well as upgrades to the signal system between the Jefferson Park and O'Hare stations. The overall Your New Blue program, beginning construction in 2014 and planned to last four years, is a package of several discrete projects ranging from station improvements to track renewal, signal replacement, traction power upgrades, and subway tunnel water mitigation efforts. 2. 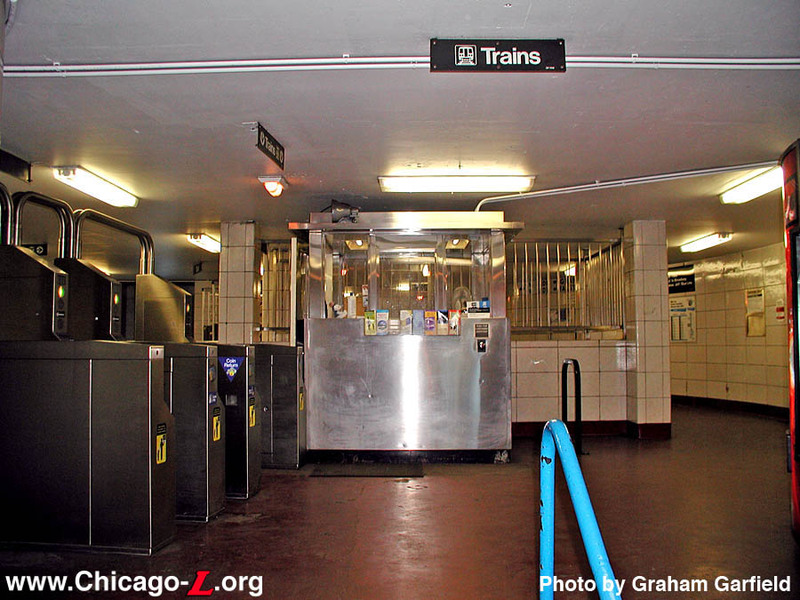 "CTA Awards Contract for Modernization of Grand, Chicago and Division Blue Line Stations." CTA press release, August 15, 2018. 3. Swartz, Tracy. "Mayor: Use $9M in local funds for Blue Line stop fixes." Red Eye, January 21, 2015. 4. 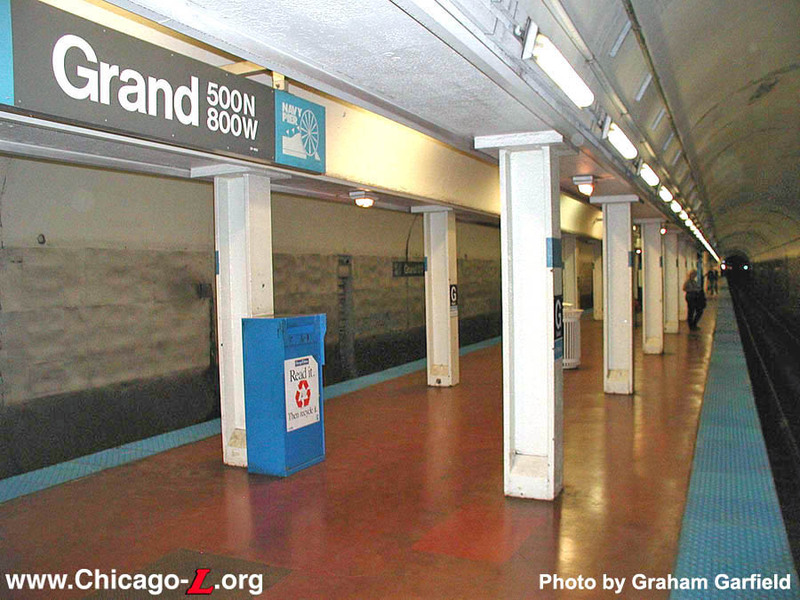 "CTA Awards Contract for Modernization of Grand, Chicago and Division Blue Line Stations," ibid.